The exhibition “Bilder fra et uskiftet bo” opens at Galleri Brandstrup Oslo on Thursday, March 12th. The show will consists of 17 new paintings, completed in egg oil tempera technique. This will be the start of a busy year for Elling; April 18th he opens his retrospective exhibition “Dette har hendt 2008 – 2015” at Haugar Kunstmuseum in Tønsberg, Norway. 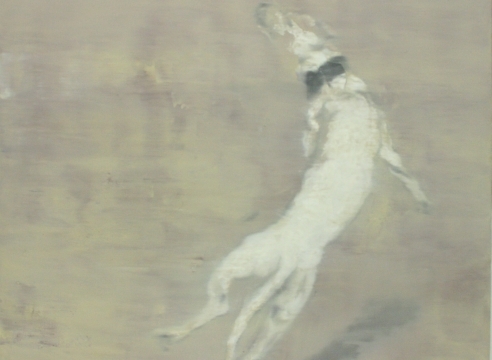 Later in 2015, he will show at the renowned Galerie Michael Janssen in Berlin. “Bilder fra et uskiftet bo” is revolved around the concept of childhood, with a focus on how terms vary and changes through the course of history. As well as showing his own stories with relations to personal narratives, he has incorporated children in different scenes from various decades and settings: a young ballerina in the woods, a child on a floor in a sixties apartment, a teenage girl looking at us with a mask of a bear. Elling also references further back in history with his portraits of infantas. “Infanta Study” is a portrait of a young girl in a baroque dress in white silk showing resemblance to Diego Velazques portrait of Infanta Margarita Teresa in “Las Meninas” (1656). The most famous infanta in art history. 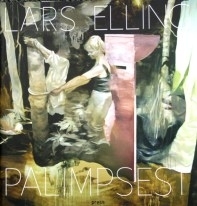 The formalistic aspect of Elling’s paintings is characterized by the erased and the broken. The pure visual expression has a meaningful function, where poetry is fundamental. The great masters inspire Elling: Diego Velázquez, Frances Bacon, Gerhard Richter and Edvard Munch. Like Richter, Elling works with the blurriness of the image to visualize what the mind sees. Richter himself points out that we do not see less on a blurred canvas, on the contrary we see more. Tempera paint dries rapidly and are normally applied in thin, semi-opaque or transparent layers. Tempera painting allows for great precision when used in traditional techniques, which requires an application of numerous small brush strokes. When it dries, it produces a smooth matte finish, as we can see in Elling’s paintings. His paintings can be seen as bursts of memory or deconstructed stories: a description of a moment, where the almost experienced or almost seen, is presented in a dreamlike expression. The layers of imagery evoke memories of childhood, with the possible disturbance and trauma written between the lines. Family is a repetitive theme in Elling’s works; familiar moments infiltrated by surprising or unpleasant elements. His works search a layered paradox of the intentional/unintentional, based on a personal pilgrimage into concentrated work and moments of surrender. “Infanta II” is a painting of great significance in “Bilder fra et uskiftet bo”, as it shows Elling’s youngest daughter in her own fake Disney nylon princess dress. The composition and image creates an immediate reference to the history of royal portraiture, from Francisco Goya to Diego Velázquez who both had long careers as court painters for the Spanish royal family. Portraiture has always been of great importance to society’s upper class, especially in the baroque and renaissance when used as an emblem for wealth, political status and connections. In the court paintings, the infantas may look like children, but they are nothing of the sort. By creating a reference between a child dressing up, and the children posing in corsets and heavy silk gowns, shows us how childhood actually is a renewed word. The children had a much different role not long ago, when the royal offspring’s where diplomatic passports, potential alliances between contemporary power blocks.